Disclosure: This post is in collaboration with PinkBlushMaternity.com. However, all opinions expressed are my own. I used to call myself Chica Fashion but whenever I am expecting or up a few pounds I am at a complete loss on how to look cute while feeling comfortable. This time around I tried a couple of items from Pink Blush Maternity and it was amazing, the two tops I picked out were on heavy rotation during the last few weeks of my pregnancy. To begin dressing your straight shape before anything you first must know that you fall under banana shape and know what that means. You can use this body type calculator if you aren't sure. You may have also seen it on the Chica Fashion Facebook Fanpage. Banana, or straight (rectangular) shaped women's waist measurement is less than 9 inches smaller than thier hip or bust measurement. I personally fall under this category because my waist is about two- three inches too big other wise I would fall under hourglass. I will give you a few tips on how to dress your shape to make it appear more curvy and flattering. Sequin Leggins... HOT or NOT? For those of you who follow me on twitter and actually read my tweets, you know how I have been longing for a sequin blazer. I found two possible options, however one is a Garcia Sequin Blazer $88 and the other is a Kensie Jaket at $99.99. Now to some that may sound pretty reasonable or maybe inexpensive. However, for me, a budget fashionista that is out of the price range I was willing to spend. I do give myself a free pass every now and then for a splurge Item and I think that this sequin blazer maybe it. Of course, I will try to save as much as I can which is why I may go with the $99.99 Kensie Jacket, Three Quarter Sleeve Sequined Blazer from Macy’s. It is marked down from $128 and I will be using a coupon! Hopefully a 20% off and if I can locate it at one of my local Macy's I won't have to pay for shipping. What is with my latest obsession, a sequin blazer? Oh, I don’t know maybe that It can be either dressed up or down and that the possibilities are endless. The third look: stretch skinny pants in sliver, lace racer-back tank, peep-toe booties and black accessories. The fourth look: Jersey tank slip dress in olive, lace front peep-toe bootie with gold accessories. Need less to say all will be finished off with the Sequin Blazer! Hello, my name is Alicia Gibbs and I am addicted to twitter lol. I feel like I have to check in every 5minutes. During one of my check ins I came a across a tweet from @TerrysTwoCents where he posted 4-5 looks he had submitted for his #wearorpurge outfit of the day. The first thing I noticed was that all his outfits included a blazer. I asked if he had ever considered wearing a cardigan, sweater or vest. He said he has not because he does not want to look like Mr. Rodgers. I can understand his hesitation; if you pick a knit that is to large such as a cable knit, it will give you the impression that you are wearing your grandpas cardi. Cardigans are now a very trendy and fashionable piece for a man to have as part of his wardrobe. They give you a put together look while still being classic and stylish. These aren't your grand-daddy's sweaters! 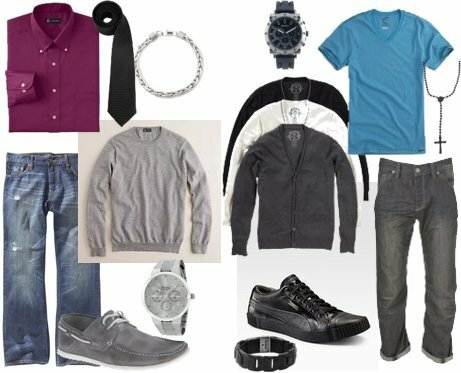 This is how I came up with the post how to wear a cardigan for my Chico Fashion. A cardigan can be used as a structural piece to tie an outfit or look together the same way you would with a blazer. You are still able to wear a button down under with or without a tie. They can also be worn with a t-shirt as well, my preference is a V-neck . Cardigans, sweaters, and sweater vest can be worn with jeans, slacks or dockers and can be either dressed up or down.